Infantrymen of the North Shore Regiment boarding an Alligator amphibious vehicle during Operation VERITABLE near Nijmegen, Netherlands, 8 February 1945. LAC. Feb. 1/45 — Ned Stuart left for St. Omer to join #21 Gen. Hospt. Col. Kerr brought me the grand news that my last culture was Diptheroid rather than Diptheria. Another smear will be taken on Feb. 2 if negative I will go out on Feb. 4. Paul, Cpl. Roanes and Baughen visited. A party in my room in the evening. Maj. Carter Corps H.Q., Maj. Funnel, Corps H.Q. Maj. McKay, Imperial Ordinance, Lieut. White, Essex Reg., N/S Owen and myself. A good time had by all. Feb. 2 — Usual day, nothing of importance. Feb. 3 — Saturday. Smear negative. If everything is o.k. will be leaving tomorrow. Small party in my room at night. Feb. 4 — Left Hospital at 4:00 p.m. Roads terrible. Took three hours to get from Turnhout to Zielst. A grand reception awaited me. The room decorated with Welcome signs. Joep took charge. She is the cutest thing — black skirt, khaki shirt wit collar, black trimmings on sleeves and pocket, black tie, and a crown on her pocket. Believe me, she is certainly looking after me. Nothing dong in the Unit at all — Field Surgical has left and once more we are down to six Officers and four Nurses. Very, very quiet. The roads are terrible, absolutely buried in mud, no bottom at all. Transport is very difficult. I am resting most of the time, but perhaps will start work in a few days. Feb. 8 — Rumour has it that the big push is starting. Last night was terribly noisy — aircraft everywhere. Dolly Vincent and Lutes go on leave to England day after tomorrow. They will be relieved by two girls from 20 G.H. Was out to the airfield today. The first time for over one month. Am gradually getting stronger, and am doing a little more work. Feb. 10 — Gordie and I went to Army H.Q. in Tilburg. Had lunch with Col. Gossage and got a little information on our future. In the evening we had a picture show in the Mess “The White Cliffs of Dover.” Dolly Vincent and margaret Lutes went on leave to England. They were relieved by Miss Watts (Calgary) and Miss Bradley from No. 20. Feb. 11 — Very busy today. Maj. Stevens and Lieut. Jones (British) were down to see me about Air Evacuation. They had lunch with us. Very wet and miserable. Feb. 12 — Usual day of admitting and evacuation. Timmy Cameron dropped in for lunch and we had a very pleasant hour before he returned to Tilburg. Terribly wet and muddy today. Feb. 13 — Drove Mrs. Wickers over to Schijndel near ’s-Hertogenbosch to visit Joep. WWe stayed to dinner and then went onto 8th Gen. Hosp. 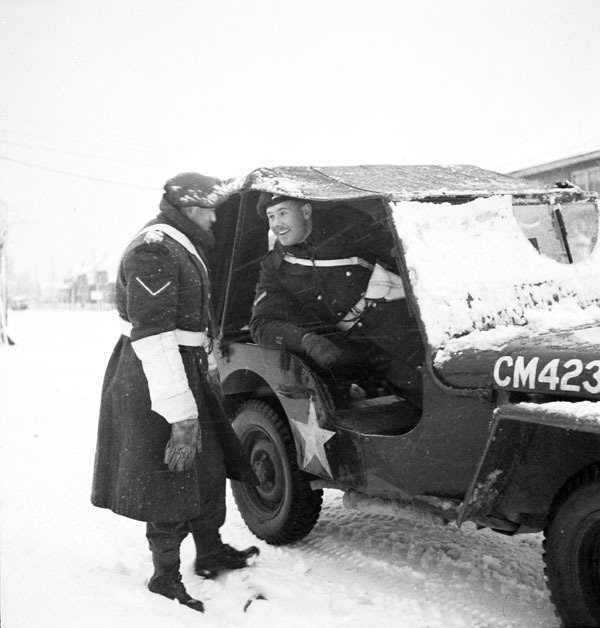 Feb. 14 — Gordie and I drove to 9th FDS in Turnhout, then to Army Troop h.Q. — twenty one kilometres south, then back to Tilburg where I visited Brig. Elder and Col. Gossage. learned about a proposed move for us — will probably have to recce a spot in a day or so — will still be on air evacuation work, worse luck. We are now planning a dance in the Officer’s Mess on Saturday night. Feb. 16 — Hans has gone to Tunrhout today to get supplies for our big dance which comes off tomorrow night. This afternoon Ronnie has disappeared and I have been looking after things. On Monday I have to make a recce of a building near Tilburg. Nothing of interest today. Feb. 17 — We had another dance in Mr. Basselman’s home. It was very nice, just like the others. Paul has been in Brugges for several days stranded as no aircraft are flying. Feb. 19 — Reported to Army H.Q. in Tilburg at 9 A.M. and was sent to Maria Hoffen Reguee Centre on a recce. It is near Giles Rijen Airport on the road between Tilburg and Breda. Returned to H.Q. at noon and gave my report. Am now awaiting further news. Ronnie leaves for England in a couple of days on leave. I hope to get away on the 8th of March. Terribly foggy and wet these last few days. Feb. 20 — Very foggy. No flying weather at all. Feb. 21 — Inspection by Col. Morgan Smith — place not in good shape. i.e. billets. Very busy today. Good flying weather. Drove Joep back to her school in Schijndel. Feb. 22 — General cleaning up in area. Ronnie flew to England today. I will be very busy for the next ten days. Feb. 23 — Visits by Lt. Col. Stone, Capt. Jennings and Major McLaron — the latter is O.C. of 13th FDS who came over on the boat with us. Turkey declared war today on Germany and Japan. Very busy today — lovely flying weather. Dolly Vincent and Clare Lutes arrived back from England today, but I have not seen them yet. Feb. 24 — Beautiful flying weather. We are quite busy. Dolly and Miss Lutes. returned from leave. Mr. and Mrs. Wilbers went away for the week and left me in charge of the children. Feb. 25 — Went to both 6th and 8th Gen. Hosp. I had a little party at 8 with Eddie Walstein, Gross, McNaughton, George Curray, McMann. Feb. 26 — Today completes my fourth year in the Army. We have been very busy for the past few days. The flying weather has been good and a great many patients have been coming through. As the header suggests, I’m getting caught up on all of the missed entries when I bogged down earlier this year, from January through to the beginning of May. Without further ado, here’s January 1945, the beginning of the end of the Second World War. Lance-Corporal Eddie Halverson (left) talking to Lance-Corporal Phil LaRoque, Nijmegen, Netherlands, ca. 9 January 1945. LAC. Jan. 2, 1945 – Went down to 7th Gen. Hosp. in Turnhout — stopped in at 1098 Work Shop and had lunch with Capt. Pollard then went on. Met Edwin Stuart for the first time. Being the first relative either of us had met in Europe we had quite a celebration. He will spend next Sunday with me. Jan. 4 — Our nurses entertained twenty Nurses from 8th Gen. Hosp to a tea. They were a grand bunch of girls and we enjoyed having them very much. Jan. 5 — Joep, Gordie and I went again to Turnhout — had supper an spend the evening with Capt. Pollard, while his men fixed up our car. Jan. 6 — Vic Railton, Eddie Wolstein, John Helsman, Shaddock, N/S Bright, Thompson, DeRosiers, Joep and myself went to both the 6th Begn. Hosp and 8th Gen Hosp Dance. Had a lovely time. Jan. 7 — Edwin Stuart and N/S Fair visited us in Zielst. In the evening I drove them back to Turnhout and unfortunately had my throat swabbed. Jan. 8 — Hans, Ronnie and I went to No 8 Gen Hosp on a Board of Enquiry — rotten job. While there, got notified that I had Diptheria and must report to nO. 7 Can Gen at once. When we got home I found three others with sore throats — a little refugee boy, Mrs. Wilbers and Joep. We all came in and now all four of us are patients here with Diptheria. Darned tough luck. Jan. 9 — Just told that I must be in bed for four weeks then go to a convalescent Camp for three months. Goodbye Army. Jan. 10 — Nothing of much interest occurring. Smears still positive. Still in bed and have no more information. Hoping someone will be in from the Unit this afternoon. Brig. Farmer and Ronnie both arrived. The Brig. assured me that he would do all in his power to hold the Unit open for me, and Brig. Elder told Ronnie the same, so perhaps I will get back to my own bunch again. Joep and her mother went back home today. Jan. 11 — Very quiet and uninteresting her today, but I am hoping some will come from our Unit this afternoon. I have read and written today until I am sick of both. Helen Bright and Hans Geggie from our Unit were in today and we had a grand visit. Hank Williams who came from Italy with me was also in, so the time passes. I ahve my radio rigged up now so all in all, things are going o.k. Jan. 12 — Col. Lockhardt of the 17th Light Field Ambulance just called in. There is a clinical meeting here today so somebody from our place should be here. Bored stiff. Can’t help it. This afternoon I had several visitors and really enjoyed myself. Brig. Elder was in for about 1/2 hour, Marion Thompson, Verna Murray, Ronnie, Chas Ross, Murray Downing and Hank Williams. This evening Ginger Reinhdardt from the Holy Cross came in and spent the whole evening with me. It was grand seeing her again. Ned Stuart came in later and after he had gone, an English Col. came in and talked for a very long time. The day has passed very plesently. Jan. 13 — A very quiet day. In the morning Vic Railton and Don Millon came down from the Unit for a while. In the afternoon Dibb was down and in the evening Majr. McNeil dropped in. I am getting used to lying here but can’t say I like it, however, one week is nearly in, only three more to go. Walt McGibbon was in for a few minutes. Have not seen him since June. Jan. 14. — Sunday — a long day. Ronnie came down in the afternoon and Ginger Reinhardt spent part of the evening with me, but there have been an awful bunch of hours in today. Jan. 15 — One week ago today since I came in. Ned Stuart was in for a long talk this morning. Just dinner time now, have slept most of the morning. There seems to be a lot of new patients coming in. Nick Carter and Verna Murray were down this afternoon to discuss their wedding. Very bad news — I am losing Marion Thompson and Helen Bright tomorrow — my two original nurses. Jan. 16 — Marion and Helen were down to say “Goodbye”. Gosh I hated to see them leave. The old Unit will be different when I get back. Ronnie was in this morning for a few minutes. Don’t expect to see anyone from the Unit for a few days now. Jan. 17 — Lang and Cameron dropped in with my mail and a parcel. In the evening Miss Auld from Calgary came in and talked for awhile. Nothing new. Jan. 18 — Dolly Vincent was down at lunch time. Mac and Ronnie came in in the afternoon. Very cold and miserable today. News of the great Russian advances. Jan. 19. — Cameron dropped in. Very stormy today and not much happening to pass the day away. Jan. 20 — No heat, power or light on today. Ronnie and Mac came down this afternoon and brought young Johnnie Wilbers with them. Just bed time. Twelve days in now. Jan. 21 — Another day nearly finished. Ronnie was down this afternoon. Poor kid, everything seems to have gone wrong, but it will straighten out. Jan. 22 — Hans was in, had brought Mac down to 9 F.D.S. Hans goes to England tomorrow on leave. Gordie came in later and spent quite a bit of time with me. Murray Downing has been with me all evening. Jan. 23 — Ronnie and Maj. Whiteside from #8 came down and held a review of our recent Court of Enquiry. Will me mighty glad when that thing is all cleared up. Nothing new today. Jan. 24 — Ransome and one of the other boys were down and brought me some letters and parcels. We had a nice visit. usual day today — nearly sixteen days in — only twelve more I hop. Miss Auld from Calgary spent the evening with me. It was very pleasant. Ned Stuart dropped in for a while. Jan. 25 — Seventeen days about gone. Ronnie and S/Sgt. Howell were down for awhile this afternoon. Gen. Burns inspected the hospital today. Everything was quiet. Jan. 26 — A lot of visitors today, Henderson, Slim and Sgt. Brady, then Sgt. Carter and N/S Murray, and finally Maj. Gross of Calgary. My eighteen then day is now about over. Maj. Stuart received notice today to go to No. 21 Gen. at St. Omer. He is not awfully happy about it, but his own Hosp. 320 is not opened yet. Jan. 27 — A very good day today. My first negative throat culture. Col. Hazzard, Major Gross, Archie Hardyment, Paul Carson, Capt. McDonald were in today, so I have had visitors nearly all day. Jan. 28 — Ned came back tonight from Zeelst where he spent a week end with my folks. I expect to get home one week from today. Boy, that will be the day. Slim came down and spent the afternoon with me — it was the first real long talk I have had with Slim since I loaded him on the ambulance in Italy. Jan. 29 — Very cold, Ronnie and Van were down today. Freddie Jenner dropped in for a visit tonight. Buzz bombs falling around all night made an awful racket. Two negative cultures now, in hopes of going home on Sunday. Jan. 30 — Freddie came in for a long chat this morning. Dolly Vincent and Lt. Col. Stone were in this afternoon and Eddie Walstein was down this evening. After they all went, I have had quite a spree of writing letters. Another day about over, hope for a negative culture tomorrow. Jan. 31 — Eddie Walstein was in. Verna and Nick came back My culture came back positive, knocking all my plans in the head. A wee party at night. Sgt. Sherwood from Main Corp H.Q., Gordie and I drove up to Wilhelmshaven and inspected the city and the docks. The docks appear to be in pretty good condition — but the Town down near the docks is very badly knocked around. We visited two hospitals and were able to pick up the odd bit of loot. The VSTU and Medical Stores are joining us in a couple of days, so we will be bigger than ever and will be kept very busy, but we don’t particularly care. Privates J.A. Taylor and J.D. 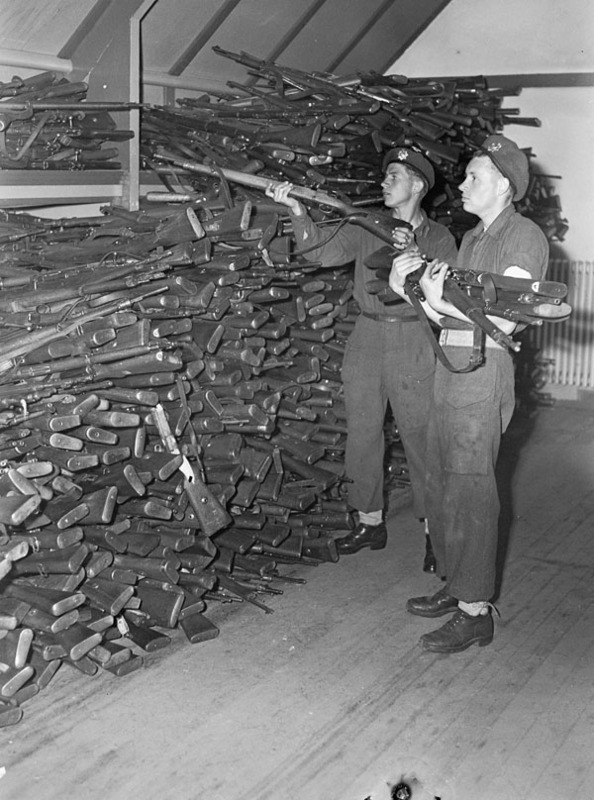 Villeneuve of the Royal Canadian Regiment stacking rifles turned in by surrendering German soldiers, IJmuiden, Netherlands, 11 May 1945. LAC. A view down the length of a street bordered by three-storey, typically Italian looking buildings. In the left foreground a British soldier is leaning into the damaged window of a building, while another British soldier is carrying some loot away from the building in the right foreground. In the middle ground to the left, four civilians are carrying large sacks of loot on their backs and are heading left around the street corner. 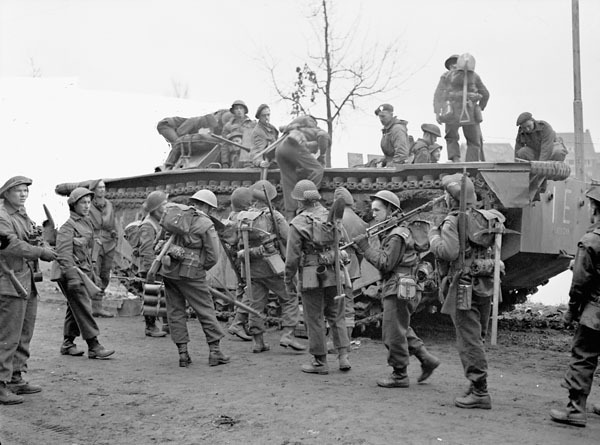 At the start of the Italian campaign many Canadians found themselves behind the front lines, waiting for their turn to move forward and join the action. On the morning of Sept. 5, 1943, shortly after landing on the beaches of Italy, they invaded deserted houses in search of souvenirs. According to Dr. Laurence Guy Alexander (Doc Alexander), medical officer for the 14 Canadian Army Tank Regiment (Calgary Tanks), “Men came out in ladies’ hats, men’s straw hats, hard hats – some carrying umbrellas and some wearing Italian soldiers’ caps. You would have thought it was a picnic rather than a war.” Just a few days later, however, some of these men would be dead, killed in what would become one of the most difficult campaigns of the war, fought against some of the best troops Germany could field. 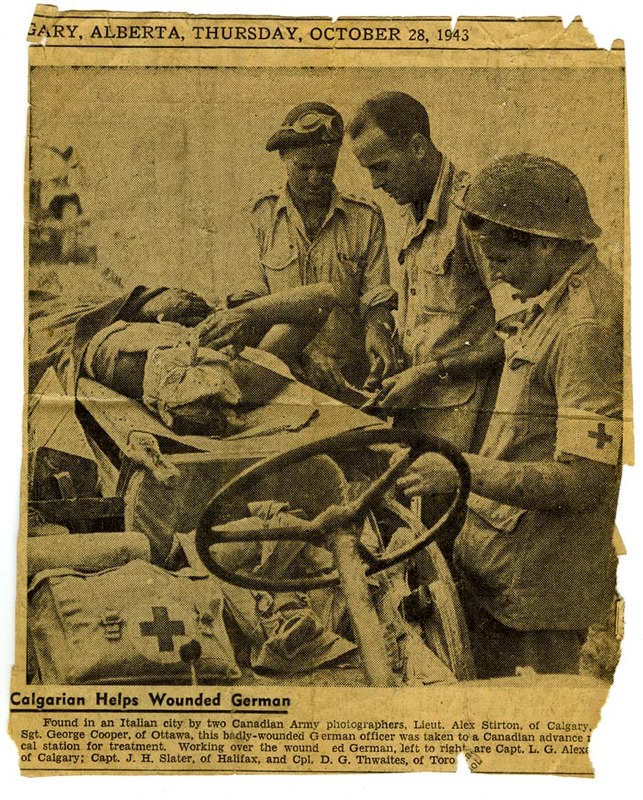 In honour of the 70th anniversary of the Italian Campaign five Bow Valley students and I will share a small part of the Italian Campaign through the words of Doc Alexander, medical officer for the 14th Canadian Army Tank Regiment (Calgary Tanks). 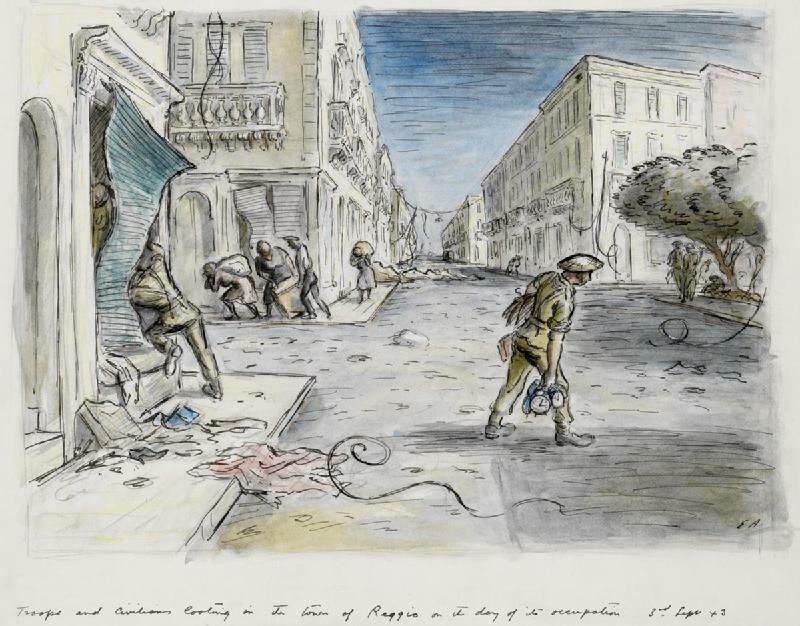 The Italian Campaign of World War Two began with the invasion of Sicily in July 1943 and ended, for Canada, in February 1945 when the 1st Canadian Division was redeployed from Italy to the Western Front to assist with the advance across Western Europe to Germany. The campaigns in Italy were Canada’s first major ground participation in the Second World War. It would result in 25,264 casualties, 5,900 of them fatal. The Canmore Museum & Geoscience Centre is hosting A Picnic Rather Than a War: The Second World War Journals of Doc Alexander Thursday, Nov. 7 at 7 p.m.